While Hubby was out planting our pumpkin plants this weekend, he happened to trim a bunch of oregano. His quick trip into the house resulted in me exclaiming, "how pretty, let me get my camera!" The oregano that we planted last year has been especially vigorous recently with the mix of warmth and rain. We decided that the best way to be sure to use all this oregano was to dry it, which required separating the one large bouquet into several small ones. With twine tied tightly around the stems, the little bouquets are dried hanging upside down in paper bags. The bags keep the oregano free from dust and debris. It just a few days, the leaves will be nice and dry and can be removed from stems. 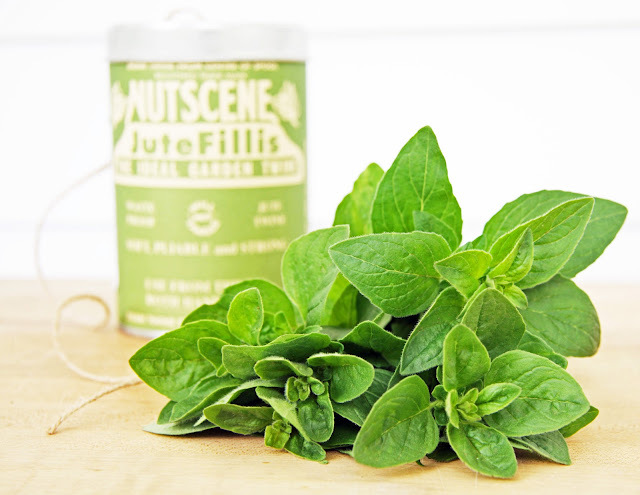 Stored in a nice tight jar for extra freshness, there's nothing like using your own herbs in the kitchen. Wouldn't dried herbs make the loveliest holiday gifts? Very pretty, indeed! Our oregano is thriving too. In fact, my husband just planted rosemary and parsley in our herb garden and had to take out some of the oregano because it's taking over. I didn't think to dry it. Good idea. I'm going to give it a try. Oregano is quite efficient at self-seeding but it is not difficult to weed the unwanted plants. And who wouldn't want to have lots of it, with all the butterflies and bees that adore it too? How lovely, Trina! I can smell it from here! 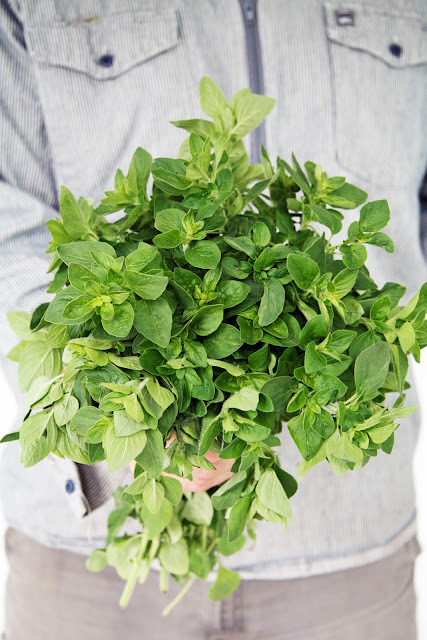 Beautiful oregano photos! I'm now inspired to go cut a bunch of mine to dry - as soon as it stops pouring outside! Artwork in its own right...lovely photos! Have you seen all of the wonderful products in the Williams Sonoma agrarian catalog? They have a lovely (and very simple design) iron drying rack for herbs. I have been eyeing it for a while now. Your pictures look so good. My herb garden was doing great. At least till now. We found out it will get down to 30 degrees tonight. Unexpected cold front. I hope they all make it thru. Time will tell. Those photos might be your best yet!....perfection. I never thought to dry my herbs. I'm lucky to live where my herbs thrive year round, with some tlc when we have the sporadic freeze. Thank you so much for the paper bag tip. Lovely photographs! I can almost smell the delicious scent. And the idea of drying it for holiday gifts is wonderful!! Thanks for this wonderful post! I had no idea it was so easy to dry herbs (I'm such a city girl). I really want to try it. Can one make pesto with fresh oregano? I know you can with basil. Just a thought. Would love to see how you package it. 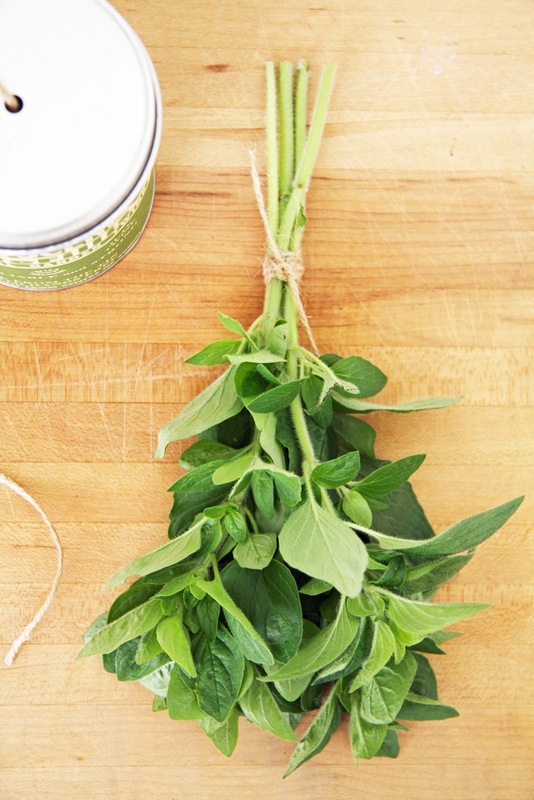 Really lovely photos and oregano is one of my favorite herbs. When you plant your herb garden, did you follow some sort of guideline? I plant mine around this idea (www.eieihome.com/blog/how-to-plan-and-plant-your-own-herb-garden.html), what about you? The time has come for me to try this. And I adore that holiday gift idea.How long do they last once dried? You make oregano look beautiful. Lovely bouquet. That oregano looks fresh! I can imagine how its aroma smells like. Your husband must have a green thumb. A job well done for him! I wish I can grow some of it too.